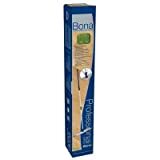 Bona Pro Series 18-inch Hardwood Floor Care System comes with everything you need for safe and easy cleaning of all hardwood floors on a professional level. The system includes a 4-inch by 18-inch mop made of professional grade aluminum, 72-inch telescoping pole, 32-ounce Bona Pro Series Hardwood Cleaner, 1-18-inch microfiber dusting pad, 1-18-inch microfiber cleaning pad. Both microfiber pads are washable and reusable over 300 times.